ACM™ Active Compliance Management: Patent-pending hybrid design combines both band-pass and vented alignments into a single, compact footprint for more output and definition. Tons of horsepower: Dual amplifier modules supply 830W pure sine wave power (2000W “peak” power) to each woofer. Purpose-designed transducers: Dual spider long-excursion woofers features large, 4-inch voice coils for increased power handling and reduce power compression. Standard IP for easy networking onboard: .Simply plug-in, and the system automatically connects to virtually any kind of IP configuration. Built for the road: Premium birch plywood enclosure with extensive internal bracing and a highly durable Dura Coat finish. Simplifies Setup of Directional Arrays: Software control and on-board dsp support virtually all directional array configurations without the need for external processing (factory presets included for basic CSA arrays). The hs-28 utilizes VUE’s revolutionary Active Compliance Management (ACM) technology to reset the size-to-performance benchmark for subwoofer systems. The combination of ACM technology and the hs-28’s highly-sophisticated on-board electronics result in massive amounts of pure, clean low-frequency energy from a dual 18-inch configuration that embodies a significantly smaller enclosure than other dual 18-inch designs. Most manufacturers design subwoofers that move as much air as possible in order to achieve maximum output. At VUE Audiotechnik, our designers believe that a high-performance subwoofer shouldn’t sacrifice definition in favor of SPL alone. Achieving a better balance of output and musicality starts by focusing on those frequencies that matter most — the critical “sweet spot” between 35 and 80 Hz. After all, a properly designed full-range speaker should be more than capable of operating effectively down to 80 Hz. From there we incorporate our most advanced technologies — from system-optimized power amplification and DSP for each individual woofer, to innovative architectures tested and honed through years of on-the-road trials. With every new design, our objective is to challenge commonly accepted compromises and balance definition with impact to achieve a more “musical” result. This goal is realized in the new hs-28, a dual 18-inch active design that debuts VUE Audiotechnik’s patent pending, Active Compliance Management (ACM) technology. Combining the best attributes of direct radiating and band-pass configurations, ACM technology begins with a truly unique driver configuration, where both woofers share a common vented chamber. One woofer’s frontal radiation is direct, while the other woofer drives a second vented chamber that has fourth-order response characteristics. Each woofer has its own amplifier and power supply, and is assigned a unique DSP algorithm. The sophisticated combination of physics and DSP enables the summed acoustic output of woofers and vents to be exceptionally flat in both magnitude and phase, while overall distortion is exceedingly low in comparison to its significant acoustic output. We put a V8 in it! Each woofer has a dedicated amplifier and power supply good for a total of 4,000 W of power. Active onboard electronics include system-optimized amplification and DSP for each driver and cabinet combination. For more information go the SystemVUE product page. Like all h-Class systems, the hs-28 ships with networking capabilities already on-board. There’s no need for additional cards or retrofitting. VUE uses standard IP protocols to simplify the networking process. Simply plug in and the hs-28 will automatically connect to virtually any kind of IP configuration. Users can then access and monitor network and device-level parameters through our SystemVUE™ software. 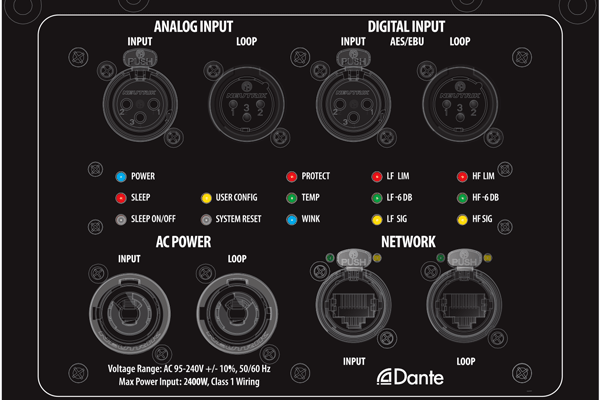 The Ethernet connection also allows the use of Dante® for audio transport.